The Moray property market is holding strong in the 250,000 - 400,000 price bracket where properties continue to sell well assuming they are in the right location and condition. The number of applicants registering with Galbraith in Elgin increased last year, up 68% from 2016. Speyside, the principal towns of Elgin, Forres and Lossiemouth as well as the Moray coast continue to be in high demand from buyers from all over the country who recognise the great standard of living available as well as the excellent value for money. Sales for the latest quarter (Oct Dec 2017) were up 18% on the previous three months with viewings up 21% for the whole of 2017 compared to the previous year. A significant proportion of sales conducted by the Elgin office over the last quarter were between 320,000 - 375,000 where a healthy number of active buyers generated some excellent sales. A number of these included some land, be it a small holding or a paddock, and when presented well and priced sensibly, these generate a lot of interest. The property market in Moray is very much driven by location, condition and price. Buyers are perhaps less compromising nowadays than in previous years when it comes to the condition of a property. Increasingly some buyers, but by no means all, are looking for a house in walk-in condition or requiring only minor works and are now much more wary of the potential hidden additional costs involved in a renovation project. That said, when a property has been sensibly priced and marketed widely, as we can do, there are plenty of buyers out there looking for the right property project. The market for properties valued over 500,000 has been slower of late. This is partly driven by the increased tax (LBTT) payable on higher valued transactions but also many prospective sellers are choosing to stay put and improve their existing home rather than incur the costs of a move, especially if they are planning on remaining in the area. Interestingly, we have noticed more buyers being sourced from our mailing list. Our research showed that 47% of sales handled by our Elgin office involved buyers who had already registered on our database in advance. This shows that we are well placed to match buyers to properties when they come to the market if not before, with some excellent private off-market sales having been negotiated over the past year. 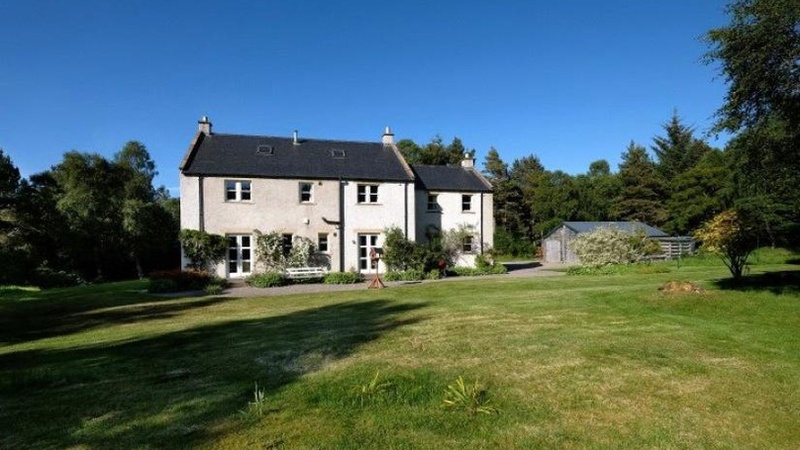 This five-bedroom, three-reception room property is an impressive detached house enjoying a rural yet accessible location with Forres, Elgin and the A96 only a short drive away. The property was designed in 1994 in the style of an extended traditional farmhouse and benefiting from the advantages of modern building techniques. The house provides flexible and well-appointed accommodation over two floors and benefits from a large and well-maintained garden together with a separate three-acre paddock which provides good sheltered grazing for horses or other animals. Letchworth Lodge is an ideal family home with five bedrooms and three reception rooms and would also make for a spacious bed and breakfast opportunity. This traditional property dates back to 1904 and combines many original features including solid wooden doors and open fires with contemporary bathroom and kitchen fittings. Outside, the well-maintained garden is enclosed by a stone wall whilst a timber decked seating area provides a lovely evening sun trap. There is also a detached garage/workshop and two separate private driveways. We offer a fully managed service for landlords so that they don't need to navigate the complexities of all the legislation introduced in the rental sector. The deadline for compliance with the new Lettings' Agent Code of Practice is 1 October 2018 and Galbraith is one of the few firms where staff in every office will be qualified by 1 April. Some firms of solicitors are handing over their properties to us to manage as they don't want to put all their staff through the qualifications. This has boosted our business.